I have been cheating on my white chocolate & french vanilla. I think I've actually become a polygamist. 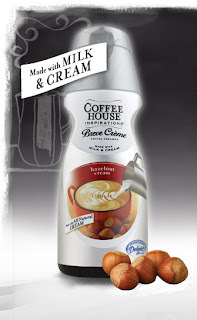 This creamer is so thick, it actually looks like eggnog (wait, this might be gross if you're not pregnant, ha!). It's AMAZING. I bought it the other day since I had a coupon and I'm cheap like that. I put it in my coffee yesterday along with my white chocolate and YUM. I was in Heaven! Note: International Delight is not paying me to post this (although I wish they would send me some free creamer b/c I'm a FAN!). Ha, yes, pregnant and dreaming. We have foundation walls (with brick)! But we do have the beginnings of a foundation. We've had the walls poured, ground work plumbing and they've prepared for the concrete slab to be poured. We're crossing our fingers that it doesn't rain so they can come tomorrow morning. If that all happens, Andy will be able to start framing the basement walls and I know he's itching to! So that's about all we've got going on right now. My father-in-law told us last night that he thinks we should be done before Christmas, which made my husband laugh hysterically because he is also working full time at his real job through this process, not to mention we're due to have our second baby on December 15. I'm not counting on it but it sure would be nice if that happened being that we're going to be sharing a room with the baby until he finishes ours! Hopefully I'll have more to show you real soon. Keep your fingers crossed for no rain!